석소현, 신성희,(2010).양부모 가정과 한부모 가정 학령기 아동의 자아존중감에 영향을 미치는 요인 비교.대한간호과학회지,40(3),367-377. Purpose: This study was done to compare factors influencing children’s self-esteem between two parent families and single parent families. 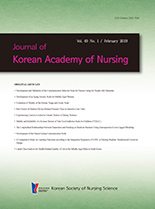 Methods: The participants were 692 children aged 11 to 13 yr (388 in two parent families and 304 in single parent families) recruited from 20 community agencies and 5 elementary schools in Gyeonggi Province and Seoul City, South Korea. Data were collected from May to July, 2007 using a survey questionnaire containing items on self-esteem, internal control, problematic behavior, school record, family hardiness, parent-child communication and social support. The data were analyzed using SPSS 15.0 program and factors affecting children’s self-esteem were analyzed by stepwise multiple regression. Results: Scores for the study variables were significantly different between the two groups. The factors influencing children’s self-esteem were also different according to family type. For two parent families, internal control, problematic behavior, school record, and parent-child communication significantly predicted the level of self-esteem (adjusted R²=.505, p<.001). For single parent families, social support, family hardiness, internal control, problematic behavior, school record, and parent-child communication significantly predicted the level of self-esteem (adjusted R²=.444, p<.001). Conclusion: Nurse working with children should consider family type-specific factors influencing their self-esteem.